How can we build our society to be a sustainable place for all, if not by supporting one another. The above before and after pictures shows a young man who was involved in an auto crash around 9;00PM, he was helpless in the Big gutter at Onitsha Expressway, Several road users (both cars, cyclist, passersby) Ignored him. Noble Citizens took it upon itself to save his life. Picked him up, rushed him to the hospital. 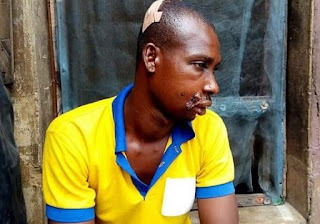 Though about four(4) different hospital rejected him due to the amount of blood rushing out of his head, But i am glad that Toronto Hospital Upper iweka finally agreed to accept him and give him immediate treatment. Today, the young man is alive and cant stop thanking Noble Citizens for the good job. To my surprised, he is married with kids. His wife was so happy that we were able to save the life of her husband. I want to thank the police who came to our support when we called them, and also thank the Doctor and nurses at Toronto Hospital. Its not easy to be passionate about saving lives. I want to use this opportunity to tell the general public that life is precious. Be good in all you do. Touch a life today and get some accolade.